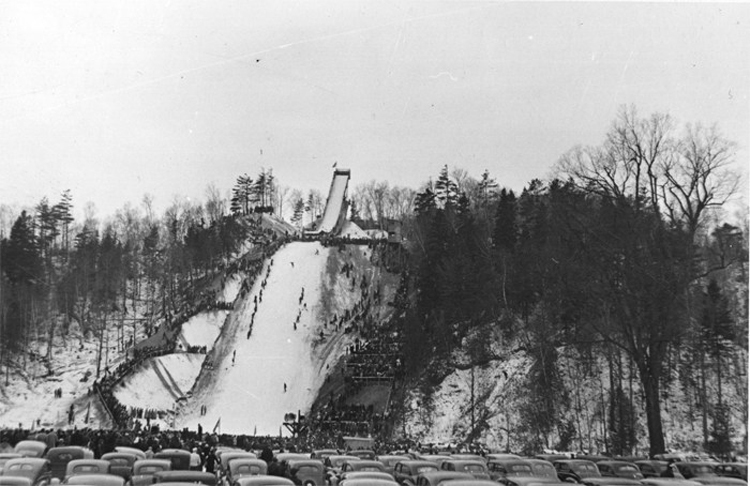 On this day in Duluth in 1941, the Fond du Lac Winter Sports Complex opened with the Duluth Ski Club’s 19th Annual Duluth Invitational ski jumping tournament on a brand new 60-meter slide. Previous tournaments had been held at Chester Bowl. Most of the 114 entrants had tried the slide the day before, averaging about 190 feet per jump—roughly 15 feet further than the record at the Chester Bowl jumps at the time. Dedication ceremonies took place at 1:30 p.m., and at 2:15 the Duluth Ski Club’s Bob Kern, competing in class C, set the first official hill record—simply by being the first competitor to jump in the tournament. His marks of 149 and 150 feet were good for 133.2 points and fifth place in his class, but his effort was far from the record that stood at the end of the day. That mark belonged to Torg Tokle of New York’s Norway Ski Club. Much of the crowd of 5,000 had come to see Tokle, who had only recently immigrated from Norway. At the time he had only competed in 24 tournaments in the U.S.—and he had won 22 of them. On his first attempt at Fond du Lac he soared down the new hill and landed at the 193-foot mark. And then he fell, setting loose a gasp of disappointment from the crowd. But he won the crowd with his second effort, a leap of 205 feet, which held as the record jump throughout the day. But his fall cost him, and Torkle scored just 79.3 points. That gave the title to Eugene Wilson of Coleraine, Minnesota’s Itasca Ski Club with jumps of 177 and 191 feet for a score of 149.7 points. Read much more about the Fond du Lac Winter Sports Complex here.